Eighty-five percent is a pretty good number. The older I get to 100, the more I think 85% is perfect. It might not be a A, but it is a B+ and that's still pretty good. 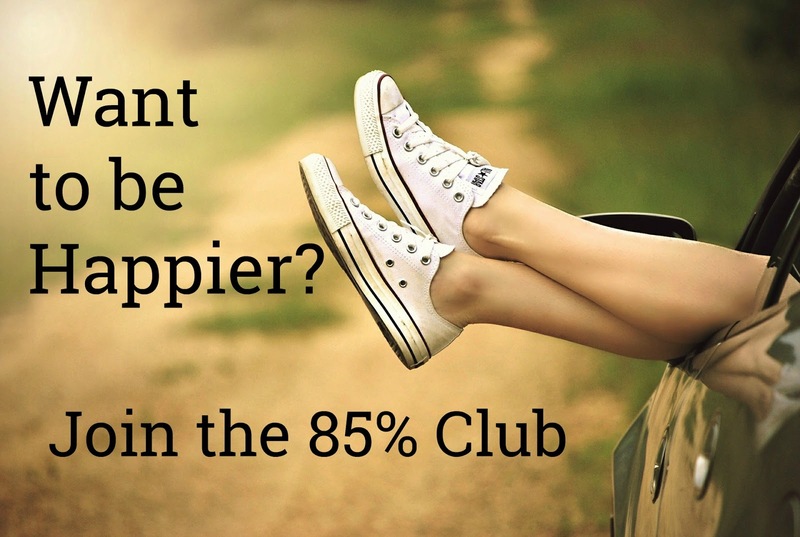 I'm embracing and making friends with the 85% because I just don't think I want to spend the energy chasing the A anymore. In fact when I was going for the A, I wasn't doing it for me. I was doing that for other people or to influence what they thought of me (can't let them see I'm not perfect). I ate the salad because I've got to look my best (for whom???). I went to every kid event because I've got to be 100% the perfect mom. I maintained my career working overtime and at night, sleeping with my work phone so I could be 100% of the employee I thought they wanted. I'm not a math genius but I'm pretty sure that you can only give 100% once, so you can't give 100% to work, 100% to your kids, 100% to your husband, 100% to your community, 100% to your extended family and friends. What do you have left to give to yourself? Well, if you take 100% from 100%, then you are left with zero. A big fat zero. A's are for egos and other people. The 85% is for me. 85% is Good Enough. 85% let's me still get close enough to my goals, and those things I feel I have to do so that I avoid feelings of guilt or failure. 85% of the time I am doing something for someone else. I'm driving kids to their events. I am cooking dinner or buying food to cook dinner. I am cleaning. I am doing laundry. I am spending 85% of my time as a SAHM doing the stuff that is necessary to keep the household afloat. The other 15%? I have turned over 15% of those responsibilities to my kids and husband. That's right, now we all have some skin in the game, so he who empties the dishwasher in the morning now sees less value in getting a new cup EVERY. SINGLE. TIME he needs a drink, and *gasp* now tells others that in fact you can use the same cup all day without something catastrophic happening. The children have stopped asking for more animals now that they are responsible for feeding them. Guess what? that wish for a second cat disappeared when they took over litter box duty. One cat and two dogs are "good enough". I have stopped volunteering at school for 100% of the things that need to happen or "oh, the poor children will suffer" Guess what? I don't even do 85% here. I have embraced the 15%. I do 15% of the things that "need" to be done. The rest of my 85% I spend on me, time with my friends, building my part time business, and pursing those hobbies I have never had time for when I gave 100% away. I have even applied my 85% philosophy to parenting. I don't need to be a perfect mom. I just need to be a good enough mom. Perfect moms regulate too much of their kids life, so if you are making 100% of the decisions in regards to your children and what activities, who their friends are, what is "nice" behavior and what isn't, what to wear, etc., your children are not learning how to make decisions. So I influence 85% of their life by asking questions to get them thinking about their decisions and the consequences of those decisions, so that they know how to make decisions. I try to keep the "because I said so" decisions to 15% because I know there are going to be days when I am just too tired to deal with lengthy explanations, and there are going to be things that happen that they don't have the wisdom yet to figure out on their own, but I am doing my best to keep that at 15%. I think I get it right about 85% of the time. I've noticed that most of our time I really don't listen to my most precious loved ones (our best friends, our husbands, our children) because I am stressing about keeping up with the 100 percents I have spread out over everything and given to 85% of the people who are not the most important to me. I'm saving my 15% for the 15% of my peeps who are most important and spending at least 15% of the time I am with them really listening to them. At least 15% of my time, I will get down my kids' eye level (which lately doesn't mean I have to bend down very far), so I can look at them, and really hear what they have to say, how they think, and for that 15% I will not give my opinion or try to change theirs. I will still have the other 85% to talk, advice, etc., but I will let that 15% (or more) be theirs. I also realized that there are 15% of people in my life that I can just let go. I can let go of the drama and the stress that they bring into my life, the commitments to events that I don't want to attend, the small talk I don't want to make, the pretending to care about stuff I could care less about. This isn't a character judgment. Some of these 15% are lovely people, but they are a better fit with someone else, so I am going to go reinvest that 15% into the people in my life that bring me joy, and to whom I can bring genuine joy to their lives as well. If you really start taking a look at your life, you will realize that there are many areas that you can pull back on, and just give 85% and the world will still go on. You may even find some areas that you realize the 15% will be just fine. You don't have to be perfect because you will never be anyway. Besides perfect is so boooooorrrrriiinnggg. I bet you will find by embracing "Good Enough", you will find yourself closer to perfect than you have ever been.